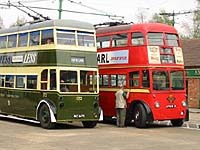 The Centre is the home of Britain's largest collection of working trolleybuses. operating on an internal network of electrified trolley wires. Experimental Doncaster/South Yorkshire 2450, the last trolleybus to be built for Britain dating from 1984, leads the queue for passengers at the loading loop. Huddersfield 631, Reading 113 and Schaffhausen 207 await their turns for duty. Bournemouth 202 and Glasgow TB78 parked up in the sunshine. A general view of Sandtoft Square showing the activity going on. Huddersfield 619 leads Doncaster 2450 into the loading loop. Reading 113 waits for Bradford 792 to pass before departing from the bus station. During Gathering 2000, Huddersfield 619 passes	swiftly through open countryside on its first run in service after 20 years in restoration It has since received a Huddersfield crest on the front. Maidstone 72 parked up the runway. Rotherham, Reading, Derby and Liege [Belgium] are represented here. The free bus service for Doncaster Railway Station.